Nice holel for the money. Nice hotel for the price - high - end of 2.5 stars. Corridors need to be redone. See above, enjoyed our stay. Would return. Friendly employees - front desk courtesy & maid & lobby staff. Good location just shows age in d?cor. The 176-room Hampton Inn Houston near the Galleria is located in the upscale Post Oak-Galleria area and provides quality accommodation equally suited to the business traveler or families on vacation. Items included with the room rate at this non-smoking hotel are a hot breakfast buffet or breakfast to-go bag, high-speed Internet access, a copy of USA Today, local telephone calls, in-room coffee and parking. There are four rooms available for business or social functions. The largest can accommodate 80 guests. Area landmarks and attractions include shopping at the Galleria Mall, the Houston business district, the downtown area and Greenway Plaza, the George R. Brown Convention Center, the Reliant Park complex and the Expo Center. The rooms and suites come with a choice of one king size bed or two double beds. The amenities include a work desk with high-speed Internet access, coffeemaker, hairdryer, iron and ironing board, telephone with voicemail and dataport, easy-to-set alarm clock and television with cable news and movie channels and pay-per-view movies. Some rooms have the added benefit of a microwave oven and refrigerator. Handicap accessible rooms are available. This hotel has an outdoor swimming pool and a fitness room. The 24-hour front desk has safe deposit boxes and information on area events and attractions. Other amenities include a business center, laundry and dry cleaning services, an ATM daily housekeeping and ice and vending machines. The complimentary breakfast is the only meal served here. Restaurants nearby include a California Pizza Kitchen, PF Chang's China Bistro, Sullivan's Steakhouse, Le Peep, Landry's Seafood House, Ninfas, Maggiano's, Pappas Seafood and a Cheesecake Factory. 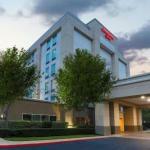 It was the upmarket location of this Hampton Inn that impressed many guests who stayed at this Houston hotel. There were some minor moans that the property was a bit pricey but most clients appreciated the quality accommodation that was both spotlessly clean and comfortable. The cheerful crew of employees had had helpful hints about shopping in the area and knew the best places to dine. Many first-time visitors said this will be their hotel of choice on future visits to this Texas city.